Solar Roadways received a $100,000 grant by the Department of Transportation last year, and it is good to see all that money put to good use with a spanking new solar-powered road prototype. 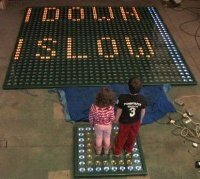 Currently, Solar Roadways is in the running for an award as a finalist (“Most Promising Renewable Energy Award”), and initial tests have shown that their pedestrian warning system with a couple of small kids worked like a charm – whenever one of the little ones step on the crosswalk panel, the Solar Road Panel lights up with a warning “SLOW DOWN” for drivers. This ought to help reduce the number of accidents on the road somewhat in the long run, don’t you think so? Solar Roadways hopes to see these solar-powered panels make their way to driveways, parking lots, walkways, playgrounds and even bike paths sometime down the road.